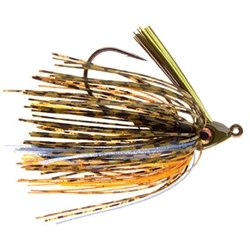 Santone's Rayburn Swim jig is loaded with a 5/0 2X strong Mustad Ultra Point Hook, 3D prism eyes, super tough powder coated,, weedless head design, and high-quality silicone skirts. This extremely weedless swimming jig has a multi-colored weedguard and a double-barbed trailer keeper which is sure to keep your trailer secure and straight. These jigs are performance tested and tournament proven by lure designer Brian Branum on Lakes Sam Rayburn and Toledo Bend.